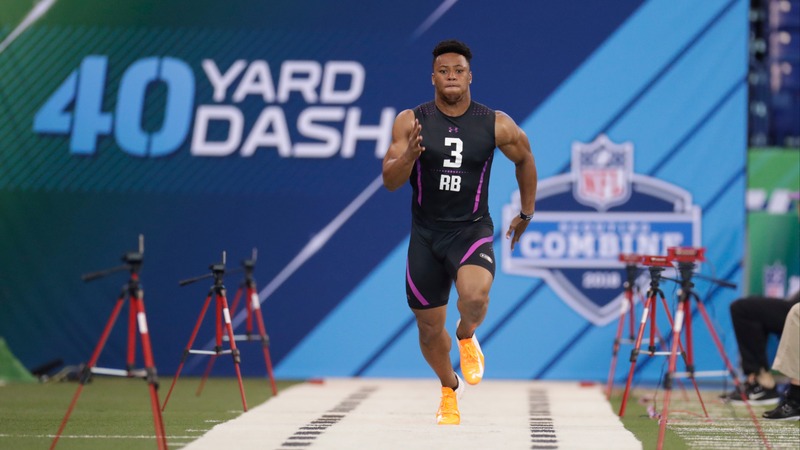 BetChicago looked at the NFL Combines over the last decade and learned that for every Saquon Barkley there is a Tyler Ervin, and for every Odell Beckham there is a Kevin White. There have been no [Mike Mamulas](https://profootballtalk.nbcsports.com/2019/02/23/mike-mamula-reflects-on-his-great-combine-24-years-later/) in recent memory, but the last 10 NFL Scouting Combines have provided a window into the future fortunes of some of the league's best rookies. They've also presented a mirage for those fantasy owners who've salivated over 40 times, bench press records and agility stats. BetChicago looked at the Combine over the last decade and learned that for every Saquon Barkley there is a Tyler Ervin, and for every Odell Beckham there is a Kevin White. Here are our top five Flashes and Flukes -- guys who lived up to their Combine hype for fantasy owners and those who didn't. Also, be sure to join our [free-to-play NFL Combine Challenge](https://betchicago.chalkline.com/games/nfl-combine-challenge). ## Flashes ### Saquon Barkley, running back, 2018 __College team:__ Penn State Nittany Lions __Drafting team:__ New York Giants __Where drafted:__ 1st round, Pick 2 __Rising Stock:__ Just as it looked as if his stock couldn't have risen any further, Barkley had a mammoth NFL Combine [performance last year](https://www.sbnation.com/2018/3/5/17080328/saquon-barkley-nfl-combine-results), running a 4.4 40, second-best among running backs behind Nyheim Hines' 4.38 and one of the best times ever for a 230-pound back. Also, his vertical of 41 inches set a record for bigger backs, he put up 29 reps of 225 pounds in the bench and posted a sizzling 4.24 in the shuttle. He entered the 2018 NFL Draft with more hype than any running back of the last two decades. <a href="https://www.youtube.com/watch?v=MK8XWYxB3Vc" class="embedly-card" data-card-width="100%" data-card-controls="0">Embedded content: https://www.youtube.com/watch?v=MK8XWYxB3Vc</a> __Early Returns:__ And of course, after the Giants pounced on him at No. 2 -- forgoing their quarterback of the future in the process -- Barkley became one of the best and most consistent fantasy performers last year in his rookie season. Barkley had arguably the best rookie season in fantasy history, rushing for 1,307 yards and 11 touchdowns while adding 91 receptions for 721 yards and four scores. If this is a sign of things to come, we've got a high first-round fantasy pick for years to come. <a href="https://twitter.com/NFLResearch/status/969663548484829184" class="embedly-card" data-card-width="100%" data-card-controls="0">Embedded content: https://twitter.com/NFLResearch/status/969663548484829184</a> ### Christian McCaffrey, running back, 2017 __College team:__ Stanford Cardinal __Drafting team:__ Carolina Panthers __Where drafted:__ 1st round, Pick 8 __Rising Stock:__ After one of the best careers by a college running back in recent memory, McCaffrey flashed his agility at the Combine, running a 4.48 40, coming in at 6.57 seconds in the three-cone drill and jumping 37.5 inches in the vert. McCaffrey also drew [rave reviews for his receiving abilities](https://www.sbnation.com/2017/3/3/14809332/christian-mccaffrey-nfl-combine-results-draft-stanford) at the Combine, and after ending his college career as a fringe first-round pick, he landed in the top 10. __Early Returns:__ As a rookie, McCaffrey showed real signs of promise, rushing for 435 yards on 117 carries with two touchdowns while catching 80 passes for 651 yards and five scores as Cam Newton's favorite safety valve. But in Year 2, McCaffrey exploded as the Panthers' primary ballcarrier, rushing for 1,098 yards on 219 carries (increasing his yards per attempt from 3.7 to 5.0 in the process) with seven touchdowns while catching 107 balls for 867 yards and six scores. A hair behind Barkley for the next five years in the fantasy football world sounds about right. ### Will Fuller, wide receiver, 2016 __College team:__ Notre Dame Fighting Irish __Drafting team:__ Houston Texans __Where drafted:__ 1st round, Pick 21 __Rising Stock:__ Fuller was terrific at the Combine, as the former Fighting Irish star ran a 4.32 40, had a top-10 finish in the broad jump and wowed in the receiving drills. He ended up the second-draft wideout, just ahead of Josh Doctson and Laquon Treadwell. <a href="https://www.youtube.com/watch?v=jcaqypkvLZk" class="embedly-card" data-card-width="100%" data-card-controls="0">Embedded content: https://www.youtube.com/watch?v=jcaqypkvLZk</a> __Early Returns:__ Fuller emerged as a capable No. 2 behind DeAndre Hopkins, despite a woeful quarterback situation. Fuller had 47 receptions for 635 yards and two scores as a rookie, then emerged with seven touchdowns in 10 games in 2017 with DeShaun Watson at the helm. Last year with Watson back and healthy, Fuller had 503 yards and four touchdowns in seven games. Across a full season, a healthy Fuller is a 1,000-yard, 10-touchdown threat. ### Brandin Cooks, wide receiver, 2014 __College team:__ Oregon State Beavers __Drafting team:__ New Orleans Saints __Where drafted:__ 1st round, Pick 20 __Rising Stock:__ Cooks [was a star](https://bleacherreport.com/articles/1970567-brandin-cooks-combine-results-and-instant-reaction) at the 2014 Combine, both on and off the field. Cooks led all receivers with a 4.33 40, then told reporters "[speed kills](https://profootballtalk.nbcsports.com/2014/02/23/brandin-cooks-is-the-fastest-wideout-at-the-combine/)." Cooks also ran a 3.81 shuttle and put up an impressive 36 inches in the vert. __Early Returns:__ Cooks was a little slow out of the gate, with 550 receiving yards and three touchdowns in 10 games as a rookie, but he's rolled off four straight 1,000-yard seasons between the Saints, Patriots and Rams, finishing with a career-high 1,204 yards on 80 receptions last year. ### Odell Beckham Jr., wide receiver, 2014 __College team:__ LSU Tigers __Drafting team:__ New York Giants __Where drafted:__ 1st round, Pick 12 __Rising stock:__ It's hard to remember now, but Beckham wasn't considered the sure thing he'd blossom into with the Giants. Before the Combine, he was looked at as a mid-to-late first-round pick. Then he ran a 4.38 40 with a 3.94 shuttle drill, and he wasn't going to last past the Giants at No. 12. __Early returns:__ We know what happened next: As a rookie, OBJ had 1,305 yards in 12 games even though he didn't debut until Week 5. He finished the season with four straight 130-yard games and seven touchdowns in the final four weeks, peaking in Week 17 with a 12-catch, 185-yard day against the Eagles. He's had 1,000 yards in three of four years since, the exception being 2017, when his season was cut short by an injury after just four games. ## Flukes ### John Ross, wide receiver, 2017 __College team:__ Washington Huskies __Drafting team:__ Cincinnati Bengals __Where drafted:__ 1st round, Pick 9 __Rising Stock:__ Ross is the poster-child for blinding speed. Or, rather, being blinded by speed. After running a [preposterous 4.22 40](http://www.nfl.com/videos/nfl-combine/0ap3000000789982/John-Ross-officially-breaks-40-yard-dash-record) to set a new Combine record, Ross shot up draft boards. But it wasn't just his sprinting skills that had scouts salivating. Ross also had a 133-inch broad jump that tied for sixth-best overall and a solid 37-inch vert. __Early Returns:__ Then as a rookie, Ross got just 17 snaps, had precisely zero catches and started his career as one of the biggest busts in recent memory. Even his second season with the Bengals was nothing to celebrate: In 13 games with 10 starts in 2018, Ross had just 21 receptions for 210 yards, though he turned seven of those into touchdowns. Now he's on the [trading block](https://www.sbnation.com/nfl/2019/2/26/18241748/john-ross-bengals-trade-nfl-combine-record-40-wide-receiver-stats), and the Bengals are surely emailing teams those Combine highlights. ### Mike Gesicki, tight end, 2018 __College team:__ Penn State Nittany Lions __Drafting team:__ Miami Dolphins __Where drafted:__ 2nd round, Pick 42 __Rising Stock:__ Gesicki had one of the best Combine performances by a tight end since Vernon Davis wowed in 2006 simply by taking his shirt off. The former Penn State star had a 41.5-inch vertical -- the best since Nevada's Virgil Green leapt 42.5 inches in 2011 -- to go along with a 4.54 40-yard dash, which tied Jaylen Samuels for the best among tight ends last year. Gesicki also put up 22 reps of 225 on the bench, one behind leader Dallas Goedert, and his broad jump of 129 inches was six better than any other tight end. All in all, a stellar performance. __Early Returns:__ Which translated into nothing on the field. After being a surprise second-round pick on the strength of his huge Combine showing, Gesicki had 22 receptions for 202 yards and failed to find the end zone last year. During a season in which 10 rookie tight ends had at least 150 receiving yards, Gesicki finished seventh in yards -- far behind third-round pick Mark Andrews (Baltimore, 552 yards, three touchdowns), fourth-round pick Chris Herndon (New York Jets, 502 yards, four touchdowns) and Goedert, who carved out 334 yards and four scores for the Philadelphia Eagles despite the presence of Zach Ertz. __MORE:__ [How fast will Kyler Murray, Dwayne Haskins run the 40-yard dash at NFL Combine? ](https://www.betchicago.com/nfl-combine-betting-guide-kyler-murray) ### Tyler Ervin, running back, 2016 __College team:__ San Jose State Spartans __Drafting team:__ Houston Texans __Where drafted:__ 4th round, Pick 119 __Rising Stock:__ Ervin had the day of his life at the Combine, running a 4.41 40, jumping 39 inches and besting all running backs in the broad jump as well. A little-known, undersized back out of San Jose State, Ervin drew some notice and moved all the way up to the fourth round. __Early Returns:__ Despite preseason talk of taking carries away from Lamar Miller, Ervin managed one carry for three yards and three receptions for 18 yards in 12 games as a rookie. After getting hurt and playing four games in his second season, he played in nine last year for the Texans and didn't register a carry. ### Kevin White, wide receiver, 2015 __College team:__ West Virginia Mountaineers __Drafting team:__ Chicago Bears __Where drafted:__ 1st round, Pick 7 __Rising Stock:__ White topped Mike Mayock's and Daniel Jeremiah's receiving charts after running a 4.35 40 with a 10.66 10-yard split. Mayock pegged him as a top-10 pick, and he was right. <a href="https://www.youtube.com/watch?v=qEm8Mg5C-H4" class="embedly-card" data-card-width="100%" data-card-controls="0">Embedded content: https://www.youtube.com/watch?v=qEm8Mg5C-H4</a> __Early Returns:__ Unfortunately for the Bears, that is. White injured his shin twice his rookie year, sitting out the whole year, then fractured his fibula four games into the 2016 season with 187 receiving yards to his name. The last two years, he's totaled 98 receiving yards. ### Chris Conley, wide receiver, 2015 __College team:__ Georgia Bulldogs __Drafting team:__ Kansas City Chiefs __Where drafted:__ 3rd round, Pick 76 __Rising Stock:__ After a so-so college career for the Bulldogs -- he never had more than 700 yards, although he did tally eight scores as a senior -- Conley climbed up draft boards after running a 4.35 40 (fourth among wideouts), nailing a 45-inch vert (first overall) and showing out in the broad jump (139 inches, first among wideouts, second overall) and bench press (17 reps, tied for fourth among wideouts). __Early Returns:__ Conley parlayed his Combine and solid pro day numbers to become the 12th wide receiver selected, ahead of better-performing players like Stefon Diggs, Jamison Crowder and Ty Montgomery. Conley had his chance to thrive with 34 career starts, including five in his rookie season, but he's never done much. In his rookie year, he managed just 17 catches for 199 yards, and last year was his best year with five touchdowns, but he has yet to top 530 yards, and the Chiefs will probably look for a better option for Patrick Mahomes. __PLAY:__ [Our free-to-enter NFL Combine Challenge. Pick six prop bets correctly to win a free BetChicago Prize Pack](https://betchicago.chalkline.com/games/nfl-combine-challenge).